COPENHAGEN, Denmark--(BUSINESS WIRE)--Today, GN Hearing unveiled the revolutionary ReSound LiNX 3D™, taking Smart Hearing to new levels to enable people with hearing loss to hear more, do more and be more anywhere in life. GN Hearing’s comprehensive ecosystem seamlessly connects hearing aids, all wireless accessories and smartphone apps to make everything work together. With the introduction of ReSound LiNX 3D and the ReSound Smart Fit™ software, an entirely new hearing care experience is made possible. These breakthroughs are developed with audiological insights and the latest advancements in technology to bring more convenience and efficiency than ever before. The new hearing care solution offers remote fine-tuning and remote hearing aid updates enabled by GN’s proprietary and secure cloud solution. After an initial fit in the clinic, the user can request assistance for any fine-tuning of their settings wherever they are. The hearing care professional can make all fine-tunings remotely to provide a better hearing experience for the user. With ReSound LiNX 3D – GN Hearing’s 5th generation 2.4 GHz wireless technology and 3rd generation binaural directionality – hearing aid users will experience excellent sound quality and will hear more than they ever thought possible. ReSound LiNX 3D delivers clear, natural sound, exceptional speech understanding and the best sense of where sounds are coming from. Users will experience 360-degree audibility and awareness in quiet and speech-only situations, improved hearing in noise when speech is in the front and optimized audibility of surrounding sounds. Together with audiologists, GN Hearing has developed a more efficient and intuitive fitting software, which simplifies the process where the hearing care professional fits and adjusts the hearing aid to the user. This faster and more convenient wireless fitting will save time for both the user and the hearing care professional. This gives hearing care professionals more time for valuable user counselling. 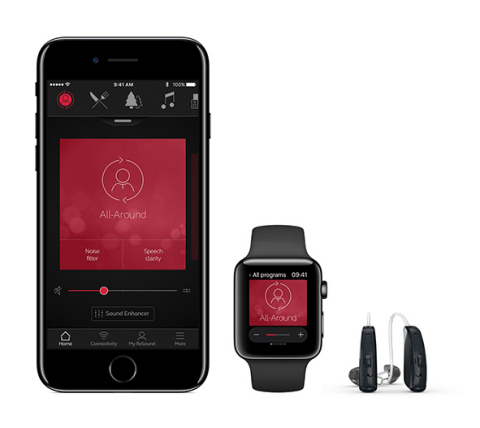 Also, a new app allows users to easily personalize and control their sound at any time on-the-go directly from a smartphone (iPhone, Apple Watch and selected Android models). The app empowers users to take even more control of their hearing experience through a built-in guidance and coaching feature, and gives users direct access to their hearing care professional for efficient optimization without the need for an appointment in a clinic. ReSound LiNX 3D is the only device with complete remote fine-tuning capabilities that allows users to stay in touch with their hearing care professional wherever they are, receiving hearing care and getting new settings via the cloud without having to schedule and travel for a clinic appointment. The unique cloud integration enables hearing care professionals to stay connected with users no matter where they are. Users will be able to share feedback about any hearing difficulty as the situation occurs, rather than trying to remember how to describe it during an adjustment visit to the clinic. Hearing care professionals will have the freedom to offer follow-up services remotely – saving time for both hearing care professionals and users, and creating opportunities for even higher user satisfaction. “GN Hearing is thrilled to introduce a quantum leap in sound technologies that will enable users to hear more than they ever thought possible. We are excited to deliver completely new dimensions in hearing care that all leads to a better hearing experience for the user and empowers the hearing care professional to better serve their clients. ReSound LiNX 3D transforms the hearing care industry, meets the modern user’s high demands for superb sound quality and fulfils our company purpose of making life sound better,” said Anders Hedegaard, CEO of GN Hearing. ReSound LiNX 3D – and the corresponding Beltone Trust™ – will launch in all primary markets around the world with a full product family in the Top and Plus performance levels. GN Hearing’s 2017 guidance already included the ReSound LiNX 3D launch. Hearing care professionals can find more information about ReSound LiNX 3D at www.resoundpro.com. Headquartered in Denmark, GN Hearing A/S is the medical device division of the GN Group, a global leader in intelligent audio solutions with a unique portfolio of medical, professional, and consumer audio solutions. GN Hearing operates through its flagship brand, ReSound, and through other focused brands including Beltone and Interton. The company leads the industry in superior sound quality and connectivity, building on the 2010 launch of the first generation of hearing aids using 2.4 GHz wireless technology. Founded in 1869, the GN Group employs more than 5,000 people worldwide, and is listed on Nasdaq Copenhagen (GN.CO). GN Hearing is dedicated to making life sound better and developing meaningful solutions that transform lives through the power of sound. GN introduces ReSound LiNX 3D™, pioneering a new hearing care experience with the company's 5th generation 2.4 GHz wireless technology for seamless connectivity, personalization, and fine tuning.